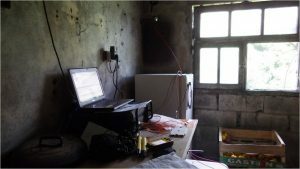 Heat has long been used as a natural tracer and monitoring temperature changes turns out to be an efficient and simple method to characterize the critical zone at several scales. Fiber optic distributed temperature (pressure and strain) is an emerging technology for characterizing stream-aquifer interactions spatially and temporally, for identifying fluid circulation in soil and boreholes and for characterizing the intrinsic properties of the aquifer. It can be installed permanently in deep boreholes, at the subsurface or in the river. Precision can be lower than 0.1 C for some cases with sampling resolution equal to 12.5 or 25 centimeters. In the last years, several works were undertook as part of WP 3 to (i) develop investigation methods and improve the use of DTS and (ii) to observe and predict critical zone processes. Firstly, DTS has been developed in hydrogeology to characterize the behaviour of aquifer systems. 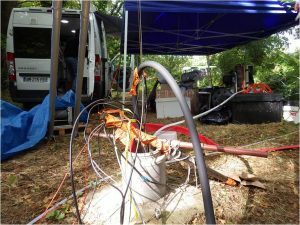 Tasks were conducted in the Ploemeur experimental site in Brittany and in the Poitiers Hydrological Experimental Site (both belonging to the H+ network of experimental sites). 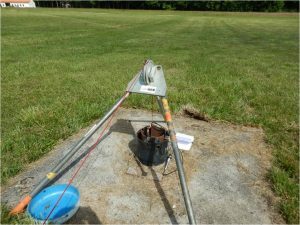 Deploying DTS in boreholes, to monitor passively temperature or to realize thermal tracer test, allowed characterizing groundwater flow, preferential pathways and heat transport. Moreover, active-DTS methods were developed, by coupling DTS with active heating. In Active-DTS, the cable, the borehole fluid or the surrounding rock formation is heated and the temperature response is indicative of groundwater flows. Thus, these methods allowed (i) quantifying vertical flow in boreholes, (ii) estimating hydraulic parameters and thermal properties of aquifers and (iii) improving the understanding of thermal-energy exchanges in heterogeneous aquifers. Figure 2: Equipment installation for a thermal advection test in a borehole in the Ploemeur experimental site (H+ Network). Secondly, DTS has been developed to characterize the unsaturated zone, which is a key element for understanding transfer process within the critical zone. 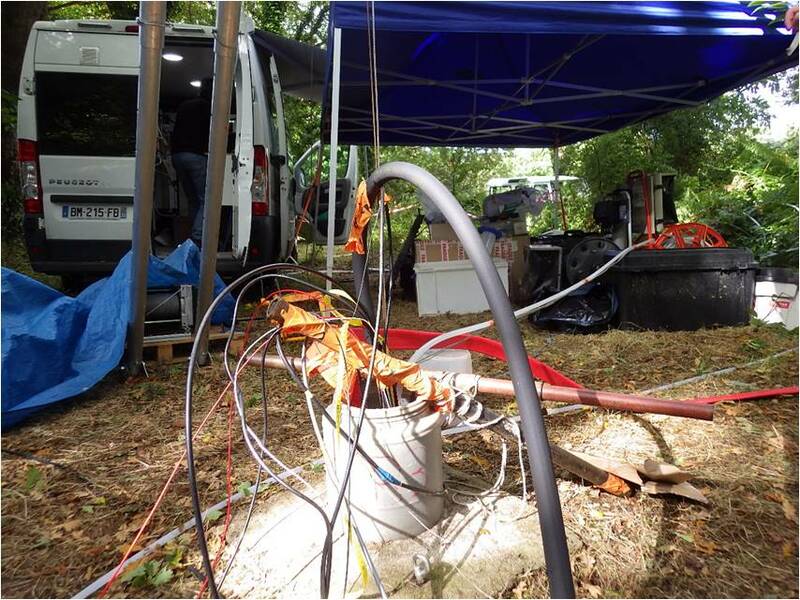 Thus, as part of WP 3, a fiber optic cable has been deployed in the Draix-Bléone Observatory Site (RBV network) to monitor soil temperature (within top 30 cm). The aim is to measure soil moisture to quantify hydrological response of a catchment to hydroclimatic changes at different temporal scale. Finally, DTS has been developed to characterize exchanges between groundwater and surface water. 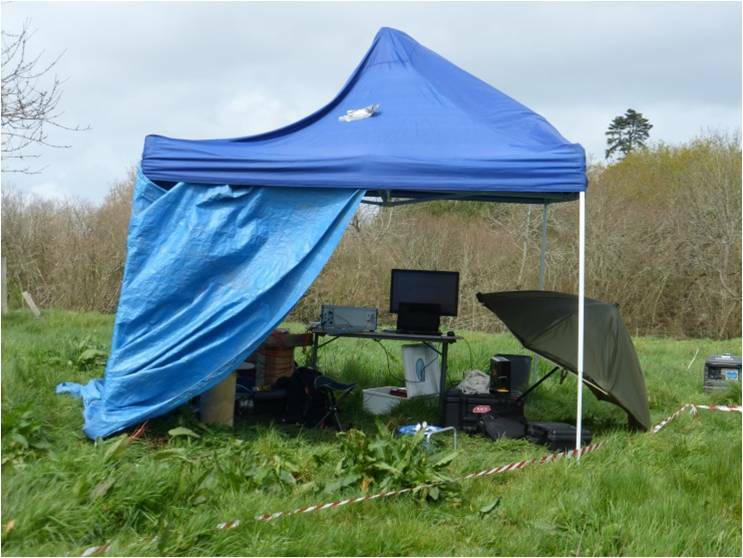 As part of WP3, DTS has also been deployed on a long term in the Kerbernez catchment (AgrHys network) and in the Orgeval Critical Zone Observatory (ORACLE Network). Deploying fiber optic cable within the sediment of a streambed on a long term allows to monitor propagation characteristics of either diurnally or seasonally forced surface temperature into the sediments and to highlight thermal anomalies, which can be associated with seepage zones. Moreover, an active-DTS method has also been established in river. 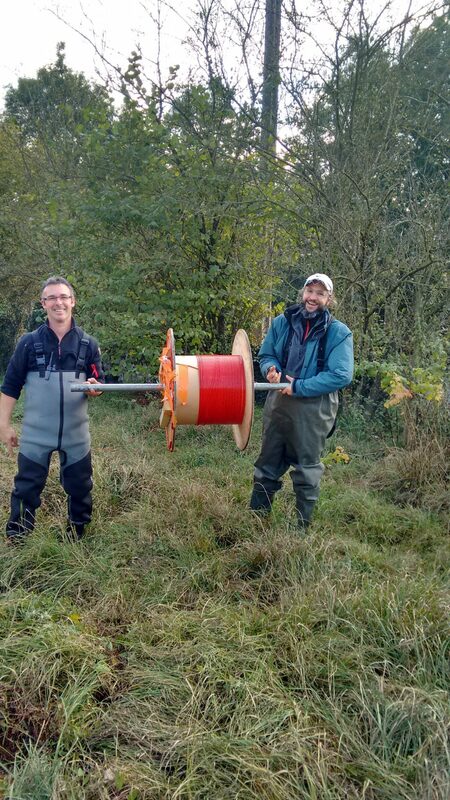 By heating the cable deployed within the sediment, it is possible to quantify interactions between groundwater and stream. 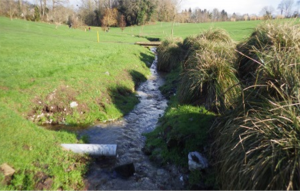 This efficient and innovative method was piloted as well in the Kerbernez catchment.